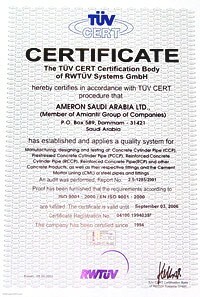 Ameron Saudi Arabia, Ltd. (ASAL) has adopted and has been implementing a well-established quality control procedures for all its products to conform with international standards requirements, as well as customer specifications, with the aim of supplying its customers with reliable products of consistent quality, which will provide maintenance-free service for the intended life cycle of the pipeline. The Quality Control Engineer is responsible for ensuring that applicable elements of the quality control system is strictly complied with as determined by contract specification; for maintaining and implementing quality control standards and procedures; evaluating test results and monitoring of the manufacturing process to be in compliance with the process standards; giving technical support to customer on quality matters; and giving potential customers and vendor inspectors an eye-view of the company's quality program. Technicians who perform inspections and tests to assure that finished products comply to relevant project specifications, drawings and standards.